Rest in Peace, Fidel Castro. That's about all I have to say. I desire that every human being will rest peacefully when their term is done here. I've seen a lot of people today hoping that Mr. Castro does not, though. 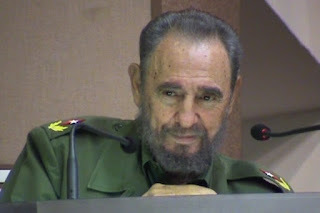 It seems to me that Castro was trying to do something good for the Cuban people when he began his revolution. And it seems that old saying about absolute power corrupting absolutely came truer and truer in his case. In other words he was an average man who, like most men in that situation, eventually became a despot. But even despots do some good for their despotisms.